The normal year contains 365 days but leap year contains 366 days. This extra day is added to the February month, that’s why we get February 29. Mathematically, Years that are perfectly divisible by 4 are called as Leap years except the century years. Century year’s means they end with 00 such as 1200, 1300, 2400, 2500 etc (Obviously they are divisible by 100). For these century years we have to calculate further to check the Leap year. First condition (year%400 == 0) will check whether the (year%400) reminder is exactly equal to 0 or not. As per the algorithm any number that is divisible by 400 is a Leap year. Second condition holds 2 statements so they both has to be TRUE. Second condition will check (year % 100) reminder is not equal to 0. If it is TRUE then the given number is not century number. As per the algorithm any number that is divisible by 4 but not divisible by 100 then that number is Leap Year. TIP: Please refer Java Logical Operators to understand the functionality of Logical And and Logical Or. This Java leap year program allows the user to enter any year and then it will check whether the user entered year is Leap year or not using the Java Else If statement. First If condition will check whether the (year % 400) reminder is exactly equal to 0. As per the algorithm any number that is divisible by 400 is a Leap year. If this condition Fails then it will go to next condition. Second If condition will check (year % 100) reminder is exactly equal to 0 or not. As per the algorithm any number that is not divisible by 400 but divisible by 100 is Not a Leap year (Century Year). We checked (year % 400) in the First If statement. Because it is failed it came to second condition. If both the first and second condition Fails then it will go to third condition. Third condition will check whether year mod 4 is equal to 0. If this condition is True then given year is Leap year because We already checked for the century years in the previous condition. If all the statements Fails then it will go Else statement at the end. 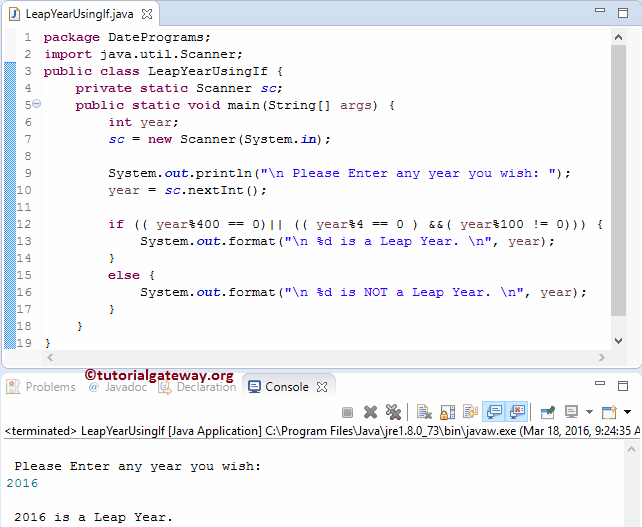 In this Java leap year program, User will enter any year to check whether that year is Leap year or Not. First If condition will check whether the reminder of the (year%4) is exactly equal to 0 or not. If the condition is False then the given number is definitely not the Leap year. If the condition is True then we have check further for the century year. So the compiler will go to the Nested If condition. Second If condition will check (year%100) reminder is exactly equal to 0 or Not. If this condition is False then the year is not century year. So the given number is definitely Leap year. If the condition is True then we have check whether the number is divisible by 400 or not. So the compiler will goto to another Nested If condition. In this condition, compiler will check whether the remainder of the (year%400) is exactly equal to 0 or not. This program for java leap year allows you to enter any positive integer (year) and then it check whether the given year is a leap year or not. In this example, we are dividing the code using the Object Oriented Programming. To do this, First we will create a class which holds a method to reverse an integer recursively. In this java leap year program, First, we declared an integer function CheckLeapYear with one argument. Within the function, we used the If statement to check whether the given year is leap year or Not and if it is True then it will return year otherwise, it return zero. We already explained the Logic in above example. Next, we are calling the CheckLeapYear method. Lastly, System.out.println statement will print the output.